A popular joke about Ukraine's spectacular - and totally unforeseen - World Cup performance and the resulting financial disaster seemed funny just a few hours ago. Then Italy defeated Ukraine in the quarter-finals in Hamburg. The joke is no longer funny, to many. 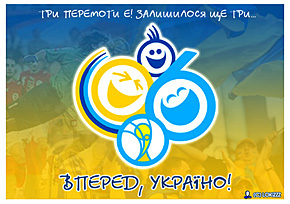 The joke describes a series of telegram exchanges between Ukrainian team representatives and Ukrainian football and state officials, it's based on the promise made by Grigory Surkis, president of the Ukrainian Football Federation: according to him, the team was to receive $28.5 million - donated by "sponsors" - if it made it into the final and won. Ten minutes before the end of the game against Tunisia. Surkis to Demyanenko: "We are getting out of the group [.] Prize money's not a problem [.] Ukraine is what matters most to us [!]" Demyanenko to Surkis: "Congratulations [!]" Five minutes before the end of the game against Switzerland. Surkis to Demyanenko: "We are moving on [.] I'll give Abram's [Chelsea owner Abramovich] money for Sheva [Andriy Shevchenko, no longer with Milan, recently sold to Chelsea] [.] Ukraine is what matters most to us [!]" Demyanenko to Surkis: "I agree [!]" Three minutes before the end of the game with Italy. Surkis to Demyanenko: "Whoa [!] What shall we do [?]" Demyanenko to Surkis: "I'm selling Shatskikh Rodolfo Gavranchich Paramon right away [.] Ukraine is what matters most to us [!]" Surkis to Demyanenko: "I agree [!]" Two minutes before the end of the game with Germany. Blokhin to Surkis: "Ukraine is what matters most to us [!]" Akhmetov to Surkis: "Agree with Blokhin [.] Am selling Tymoshchuk and a dozen coal mines right away [.]" Surkis to Akhmetov: "I owe you six points in the game with Shakhtar [.]" Akhmetov to Surkis: "Ukraine is what matters most to us [!]" One minute before the end of the game against Brazil. Ukraine's team - to all: "Too late [!!!]" viorela: So, have broken up with Russia and Turkmenistan - no [cheap] gas, defeated Saudi Arabia and Tunisia - no [cheap] oil, either. "Swiss credits! This is our last chance!" mumbled Yushchenko nervously, as he was dialing Oleg Blokhin's number. - Yeah... And then the Germans will add some more kicks in 1/2! The same LJ user katatonia-82 posted photos that he took on Khreshchatyk, Kyiv's central street, with his cell phone on the night following Ukraine's victory over Switzerland (UKR). metalliova: The city center was totally blocked by people, everyone was walking around, singing different songs and anthems, yelled "Shovkovsky," "Ukraine." The only thing this could be compared to were the first days of the [orange] revolution (only they were not drinking [alcohol] then)."